Heartfelt Love Collection and the Classic Petunia Collection. Instructions: Card size is 6 x 6”. Cut cardstock 6 x 12”, score and fold at 6”. Cut a piece of the designer paper with the hearts from the Heartfelt Love Paper Collection 5 7/8” x 5 7/8” and adhere to the card base with dries clear adhesive. Cut the same designer paper to fit the Shadow Box: one piece 3 1/8” x 4 3/8”, two pieces 1/2”x 3 1/8”and two pieces 1/2” x 4 3/8”. Cut out the opening of the 3 1/8” x 4 3/8” using the Cut Mat Create 1B die. Ink the edges with Angel Pink Ink and adhere to the shadow box. 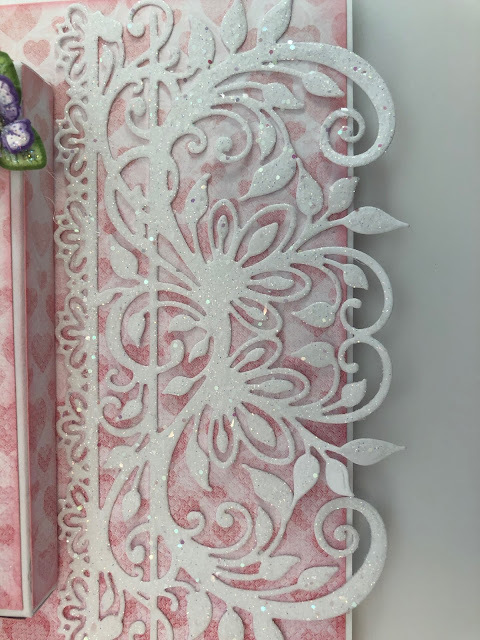 Cut a piece of the designer paper with the small hearts 3 1/8” x 4 3/8” and adhere to the inside of the box using dries clear adhesive. Adhere the shadow box to the card base as shown. Cut the Sweetheart borders die from white cardstock, sponge with dries clear adhesive and sprinkle with Rajni Chawla’s Crystal Clear. Adhere next to the shadow box. Stamp the Classic Petunias with Concord Grape and Lilac Posies Ink. Diecut using the coordinating dies, ink the edges with the same inks and shape with the Deluxe Flower Shaping Kit. Stamp the leaves with Bamboo Leaves ink, color with New Sprout Ink, and shape with the Deluxe Flower Shaping Kit. 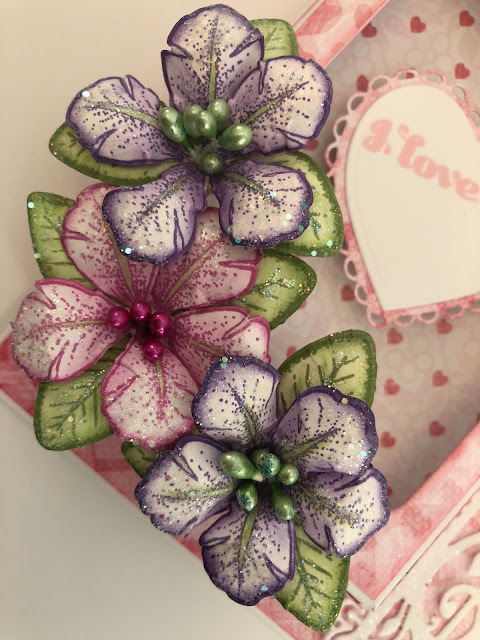 Using dries clear adhesive, sponge the flowers and leaves and sprinkle with a combination of Ultrafine Transparent glitter and Rajni Chawla’s Crystal Clear. Pierce the flower centers and add the stamens. Adhere the flowers to the shadow box as shown. Cut the eyelets hearts die from the same designer paper as the card front. 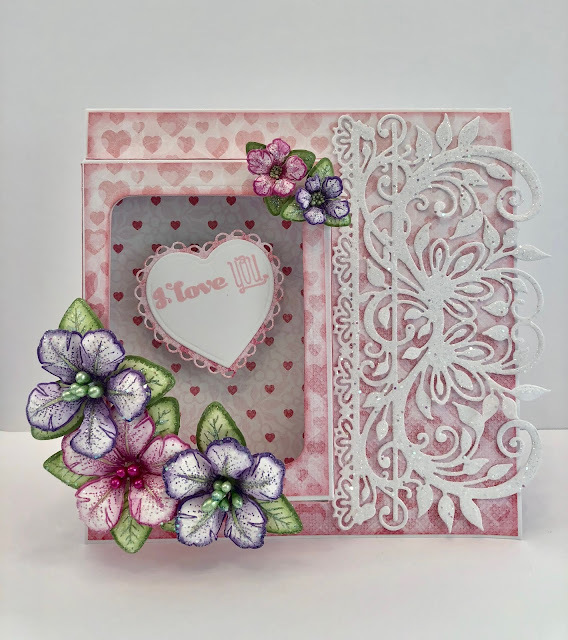 Stamp the sentiment on white cardstock using Angel Pink ink and cut out using the plain edge hearts die. 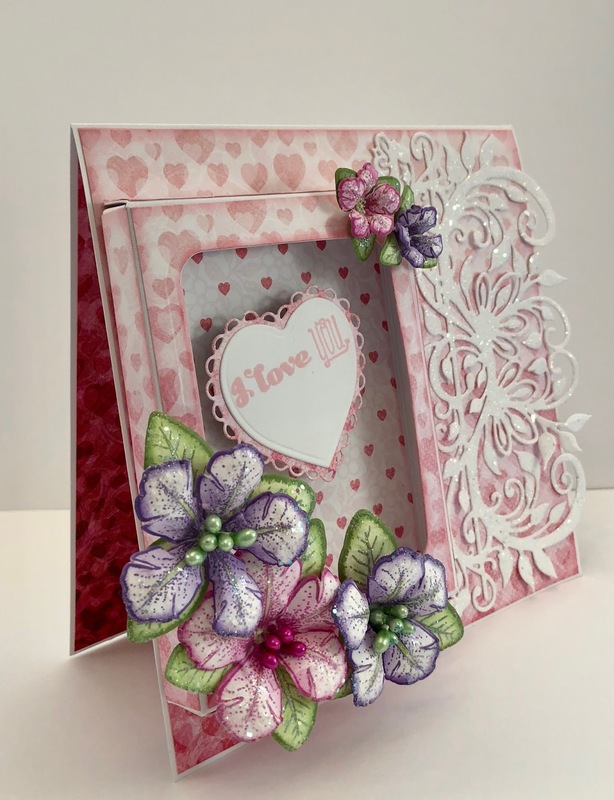 Adhere to the eyelets hearts die and use 3D dimensional dots to adhere to the inside of the shadow box. Please be sure to stop by the Heartfelt Creations Blog to see the amazing projects created by the fantastic Design Team. Oh Janet your flowers are so gorgeous! !I love your beautiful card! !